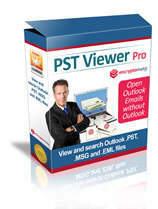 .Pst viewer for Outlook, Free Trial Download. Wondering how to open .PST files without Outlook? PstViewer Pro is the leading commercial Outlook viewer for opening .PST, .MSG, .MBOX, .MHT and .EML files. PstViewer Pro lets you View, search, reply, print and export Outlook email files. Convert Outlook files to PDF, MBOX and other formats. An .MSI file is available for enterprise environments, and user interface is configurable. * Requires Microsoft Windows (10/8/7). Uninstall by running the installer package and choosing "Uninstall," or use Windows Add/Remove Programs service. This software and website is developed and maintained by Encryptomatic LLC. View the EULA and VirTotal Scan for PstViewer Pro. Questions about what PstViewer Pro can do? Just ask us! If you have questions about PstViewer Pro or need assistance installing or uninstalling, use the Live Chat services on this page, or call us at 1-651-815-4902, x1 during US Central time business hours. We are here to help you! You can also open an online help ticket and a member of our support staff will be in touch.